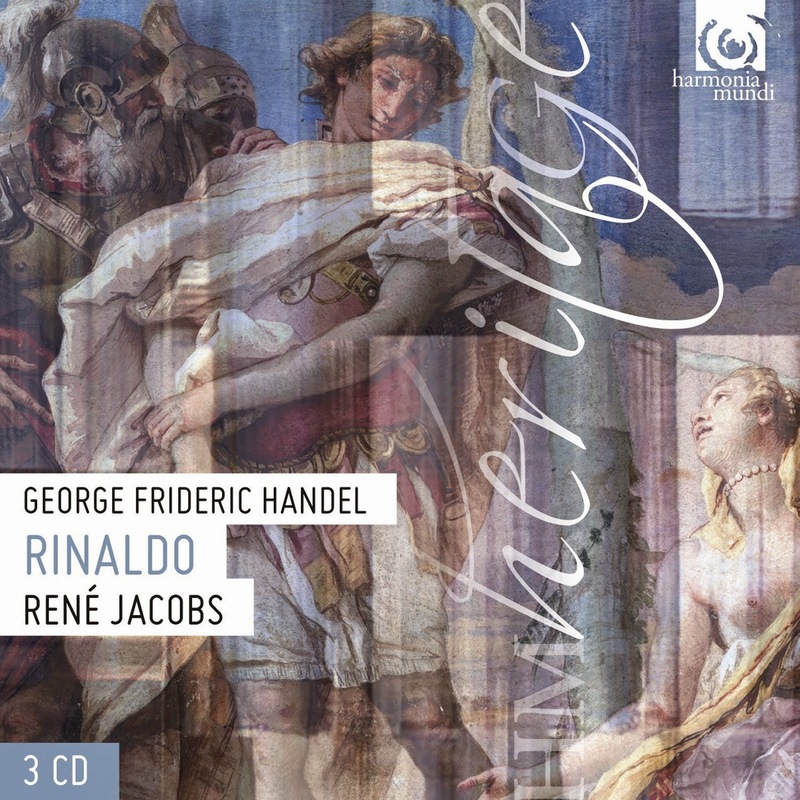 This is a re-issue of Rene Jacobs highly theatrical and imaginative 2002 recording of Handel's Rinaldo on Harmonia Mundi with Vivica Genaux in the title role, Inga Kalna as Armida, Miah Persson as Almirena, Lawrence Zazzo as Goffredo, James Rutherford as Argante, Christophe Dumaux as Eustazio and Dominique Visse as Mago cristiano and Rene Jacobs conducting the Freiburger Barockorchester. The recording has strong rivals, Christopher Hogwood's recording on Decca has Cecilia Bartoli as Almirena, and David Daniels as Rinaldo. And Glyndebourne's 2011 production (see my review of the 2011 Proms performance) with Sonia Prina in the title role and Ottavio Dantone conducting is on DVD. Many people will, of course, be hoping that there is some sort of record of Glyndebourne's 2014 revival of the work (see my review) with Iestyn Davies as Rinaldo. Jacobs' cast is idiomatic without being starry. Genaux gives a wonderfully fluent account of the role of Rinaldo, not at all phased by the technical demands and singing with a lovely evenness of tone, and firmness throughout the range. The role clearly fits her voice well, the role is one of those which lies at the upper end of the counter-tenor range. And her account of Rinaldo's music is terrific, though perhaps not as overtly emotional as Daniels' performance. This is something that I rather like, and I enjoyed Genaux' performance greatly, but some people might find it cool. Miah Persson makes a fitting foil as Almirena, from her first aria she is bright, neat and very appealing. The problem with Rinaldo is that the libretto is terrible, the characters have little emotional depth (hence Robert Carsen's decision to set the Glyndebourne production in a school). Persson charms her way through as the heroine and duets in act one with Genaux in a delightful manner. I rather found Inga Kalna's Armida a little to light for my taste. Her voice has a neat narrow focus and I could easily imagine her playing Almirena. She rather over compensates with excessive ornamentation, her opening Furie terribili was vastly over decorated. Elsewhere, Kalna does come over as something more of a spitfire but with no where near enough bite (the original singer in the role, Elisabetta Pilotti-Schiavonetti, specialised in sorceresses and would play Medea in Teseo and Melissa in Amadigi di Gaula for Handel). Lawrence Zazzo is on fine form in the role of Goffredo, Almirena's father (in fact written as a travesty role for a female contralto). He sings throughout with lovely tone, and great technical facility combined with fine musicality. This was a performance which made you wish he had got more to do. Christophe Dumaux is similarly strong as Eustazio. Dumaux has quite a narrow-bore voice, musical and sweet, yet distinctive. He is fluent in his arias and nicely characterful in the dialogue. The selection of different mid-range high voices does mean that in the recitative, you always know who is singing without consulting the libretto which is not always the case in Handel operas. Dominique Visse adds to this with a highly characterful account of the Mago cristiano. James Rutherford's Argante gets off to a bit of a rocky start, I found his opening aria had rather effortful passagework. But once past this, Rutherford is on form though I have heard more charismatic performances of the role. The opera was written to be a visual showcase and was full of effects and grand scenes. Whilst Jacobs uses the basic 1711 version of the score, he seeks to supplement what is lacking visually by adding to the music. This means that, in addition to his usual briskly theatrical conducting and dramatic flair, we have percussion and sound effects. These include weird noises during Armida's recitatives, various bits of percussion and, at one point, castanets! These are not atmospheric, but rather annoying. His choices of ornament for the music might also annoy, it is not just Armida who gets to do elaborate ornaments. This re-issue does not include Jacobs original article, but reading the review of the original re-issue on the gfhandel.org website, it seems that Jacobs was inspired by William Babell's highly ornamented keyboard versions of Handel's music. (You can hear Babell's transcription of Rinaldo's Vo fa guerra on Bridget Cunningham's disc Handel in Ireland). Again something which might appeal or appal. And Jacobs takes a similarly creative view with continuo, adding it where Handel specified there to be none and using that awful non-operatic solecism the organ. The set is at budget price, and makes a fine alternative recording of the work (under £10 on Amazon). And there is much to enjoy on this disc and it is not so much a thorough-going re-composition as some of Jacobs' recordings. I rather like the slightly cool, poised account of the main roles from the soloists and will certainly keep it on my shelves as an antidote to Bartoli and Daniels.